This is new type of post on this blog for a change, not just your usual things. I thought I would sit down and talk about those products that I am always buying and probably will for a long time. Tomorrow you will be seeing a post all about my recent Empties, but I consider that different to this post because here I am basically talking about those HOLY GRAIL items in my stash. And, I quite liked the title of this post too soo.. 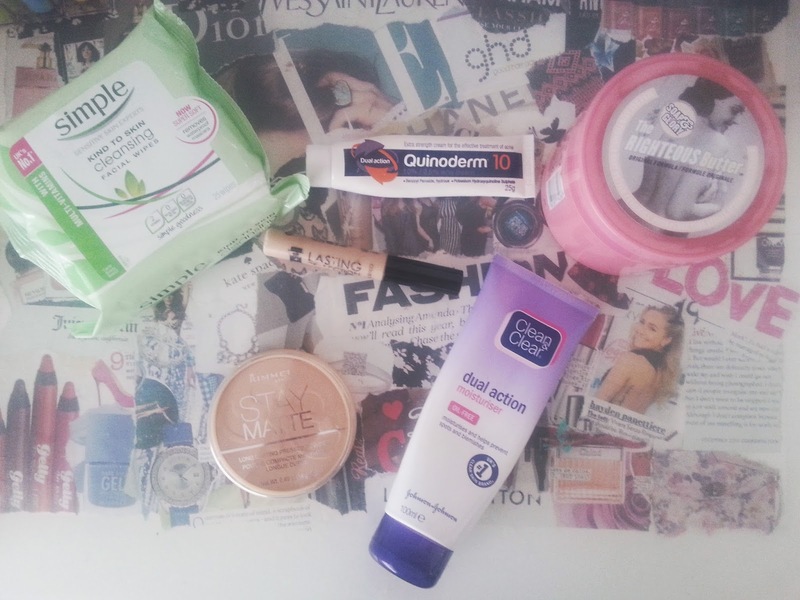 Simple Kind to Skin Face Wipes/ Yes, face wipes are a big no no. But if they are good quality I really don't see the problem. I only ever buy the big packet and still go through them so quickly, its crazy because my skin relies on them to make it better. Quinoderm Spot Cream// My solution to every problem on my face. This spot treatment is great at controlling your breakouts as well as helping to calm and get rid of them. I use this religiously every other night, not every night because it is very and I mean very drying on the skin and basically peels everything off but in the long run your skin is much better off. Clean & Clear Dual Action // Okay, so maybe I am cheating with this a little but even thought I am still going through my first bottle of the wonderful thing I am still allowed to talk about it right? The full review is here, but in a nutshell this moisturiser is great for those of you who want to control your shine, make you face feel nourished at the same time as clearing up your skin. Soap and Glory Righteous Butter// Oh S&G you are amazing aren't you. No matter which or how many body butters I buy so collect, I always seem to go back to this one from S&G. Why? Because it smells like Jasmine and the scent lasts all day on your body and it sinks in straight away, which a lot of body butter don't do. Rimmel Stay Matte// When I first bought this, I would not even imagine to have liked it this much but now I can't live without it or even with it. Perfect for shine, amazing extra coverage and lasts you a really long time. It has taken me months to get through one and to say I use it all day it certainly lives up. Collection Concealer// Won't dabble a lot about this one because you are all already sick to death but LOVE this stuff and in my lifetime will go through about 100 because its amazing! What are your holy grail, I will always need to buy you again products? Great post! I have repurchased mario badescu's enzyme cleansing gel + buttermilk moisturiser for the past seven years. Have gone through quite a lot of tubes of those two products!! !